Creating your estate plan is a highly personal and individual process. Given the importance of the finished product, choosing the right estate planning attorney to assist you should be a priority. 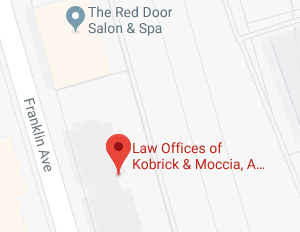 At The Law Offices of Kobrick & Moccia we understand how important your estate plan is to you as well as how intimidating it can be to try and choose the right attorney. After all, creating an individualized estate plan requires divulging a good deal of personal and financial information, something that is understandably difficult to do with a stranger. At the Hauppauge, New York Law Offices of Kobrick & Moccia, we are dedicated to creating a lifelong relationship with our friends and neighbors in order to help them with all their estate planning needs. According to historians, the first house built in what is now Hauppauge, New York was erected in 1731 on what would eventually become the Arbuckle Estates. Thomas Wheeler and his family were the first residents of the city which even took his name for a brief period of time prior to the 1860s. The name “Hauppauge” comes from the Native American word for “sweet waters.” The area was named as such because Native Americans go their drinking water from there instead of near Lake Ronkonkoma where the water was not drinkable. During the early part of the 18th century, Hauppage was known as a waypoint on the King’s Highway, laid out by the colonial legislature of New York in 1702. A century later, on March 13, 1806, “a meeting of the male members of the Methodist Society of the ‘Haupogues’ was convened at the School House agreeable to public notice for the express purpose of Incorporating and Electing Trustees for said Society.” Not surprisingly, the meeting was presided by Timothy Wheeler and Issac Wheeler who were also two of the town’s original Trustee’s. The Wheeler family continued to influence the town and its future until well into the 19th century. Located on Long Island and in the towns of Islip and Smithtown in Suffolk County, New York, Hauppauge is a hamlet and a census designated place, or CDP. At the time of the latest census the hamlet had a population of just over 20,000 people. The Hauppauge Industrial Park, located at the edge of the hamlet, is the largest on Long Island, and by some accounts the second largest in the nation. Although Hauppauge itself is only home to about 20,000 residents, the industrial park has more than 1,300 companies, and employs over 55,000 Long Islanders. Because of the large tax revenue base provided by the businesses in the park, residents in the area enjoy relatively low school taxes. The attorneys and staff at The Law Offices of Kobrick & Moccia are proud to be part of the Hauppage, New York community. We understand how difficult it can be to share your personal needs and wishes with a stranger which is why we strive to develop ongoing relationships with our clients. Unlike many other areas of the law, estate planning is not something that has a definitive beginning and end. On the contrary, estate planning should be a lifelong process and your estate plan should grow and evolve and you do over the course of your lifetime. Initially, your estate plan may focus primarily on protecting you and your young family from financial devastation should something happen to you. As you travel along through life, your estate plan may start to expand to include components that will help grow and protect your estate, such as retirement planning, business succession planning, and tax avoidance. Your plan should also be individualized to include components that apply to you and your specific needs, such as special needs planning, business succession planning, or pet planning. Finally, as you contemplate your “Golden Years” you may wish to review your estate plan and include funeral planning to ensure that your wishes will be honored and that your loved ones won’t have to endure added stress while grieving your loss. At The Law Offices of Kobrick & Moccia we would be honored to be by your side throughout each stage of your life, making sure that you, your assets, and your loved ones are protected. If you would like to discuss your estate plan, contact the Hauppauge, New York estate planning attorneys at The Law Offices of Kobrick & Moccia by calling 800-295-1917 to schedule your appointment.